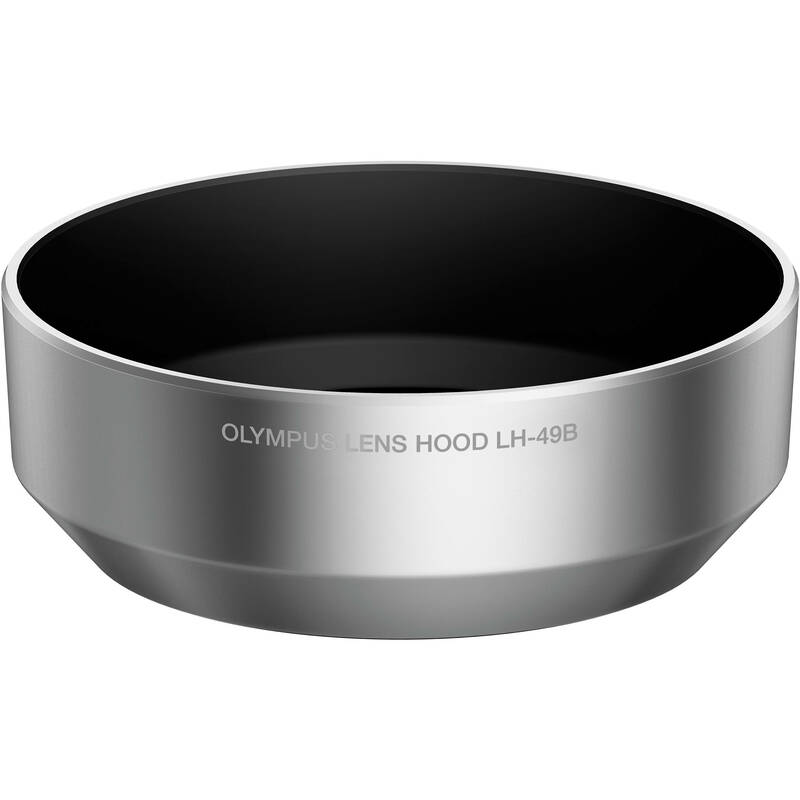 The silver LH-49B Hood from Olympus is compatible with their M.Zuiko Digital 25mm f/1.8 lens. It blocks stray light from entering the lens, preventing flare, and offers some protection to the front element against light impact, should you get a little too close to your subject. The LH-49B can be used as a spare or replacement part for the hood originally supplied with the lens. Box Dimensions (LxWxH) 4.2 x 3.4 x 1.0"
LH-49B Hood for M.Zuiko Digital 25mm f/1.8 Lens (Silver) is rated 5.0 out of 5 by 4. Rated 5 out of 5 by Adrian from Snaps securely into place I got this for a Zuiko 25 1.8 lens that I bought used and came without its hood. It is a plastic hood that snaps securely into place on its dedicated bayonet on the outside of the lens barrel. It does what it is supposed to. I use the lens and hood on a Panasonic GM5 camera, which is tiny. Both the lens and hood protrude below the bottom of the camera. Rated 5 out of 5 by Craig C. from Works perfectly as designed Works as designed. Why it's not included with the lens is beyond me. Word of caution if you are using on a drone, don't buy it because you need a vented hood to allow for airflow. Rated 5 out of 5 by Ari G. from Does what it's supposed to... Not much to say, other than it fits perfectly and is as described. How does the lens hood go onto the lens? I cannot get it to fit at all. You need to remove the ring that is around the front of the lens. Just unscrew it and remove it and the hood will fit just fine. I have tried screwing this lens hood on and it does not happen for me. Any secrets? I've had lots of lens hoods before this one (I've actually got two because I didn't realize the lens came with one) and both don't work. As Bette mentions, there's a detachable ring that covers the threads, which makes the lens look more attractive when you aren't using the hood. You untwist the ring counterclockwise, which uncovers the threads and attach the hood.